Like this 8.8 inch with 1280 x 480 resolution instead of your OEM 6.5 inch with 600 x 800 resolution? Wish to upgrade it by yourself? Now you can! 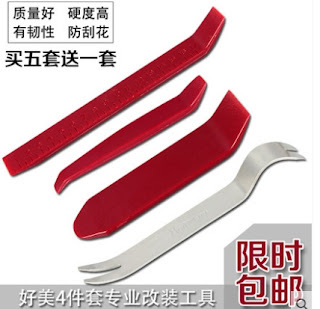 Here are the tools that you need! Note: X1 F48 also uses similar screen but the part number is 9387451. It requires CID trim (part number 9353267 for Right hand drive car) to be installed together. Step 1 : Use the pry open tool to pry the plastic cover underneath the CD drive. Remember not to pull out the plastic cover and you can simply leave it hanging. Note that there is a wire attached for ambient lighting. Step 2 : Underneath the CD cover, you can find two torx screws attached to it. 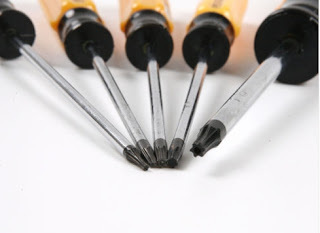 Unscrew them as shown below. Step 3: Once the screws are removed, take out the cover together with the buttons and leave it hanging as shown below. Step 4: WARNING!!! This is the hardest part! 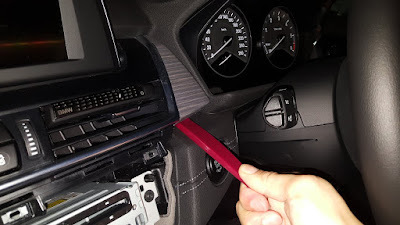 You have to remove the entire aircon dashboard using the pry open tool. Note that this will take some effort as the aircon dashboard is held tightly by the clips. 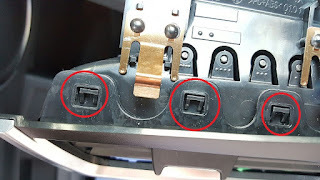 There are two separate wires connected to the air con dash board. One for the ambient lighting on the left area and the other for hazard light/lane departure buttons. Remember that there are 3 x aircon vent modules( one on the left, 2 at the center) which may dislodge by themselves and you have to fit it back slowly. Important strategy to pry the aircon dash board off from the car. Observe the arrows highlighted in orange. These are the areas that are safe to pry. 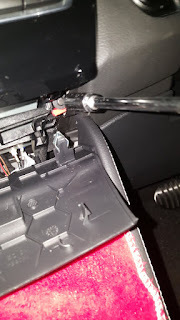 If your car comes with lighting package, do not pry open on the area marked with a red cross as it will potentially breaks your fibre optic lighting hidden underlying the dash. You will need to use some strength to pry open all corners of the dashboard slowly. Use cloth to protect your dash board and glossy surfaces from scratches. 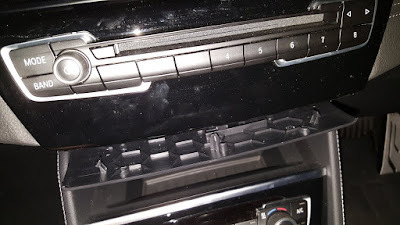 Do not pull those air con vent flaps by hand as it will detached itself easily and you will find yourself spending most of your time trying to assemble the flaps back instead of installing the screen! 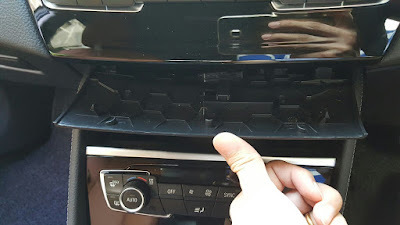 In the event that those aircon vent module drop out from the air con dash, you have to snap the module back to the dash first before pushing the entire air con dash back to the car. 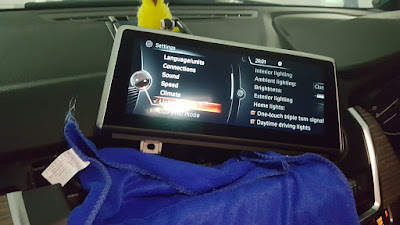 Note the highlighted areas where the aircon module needs to be clipped back onto the aircon dash before putting the entire dash board over to the car. Warning: Remember that there are no more screws held within the air con dash board and you have to pry it open with full confidence! 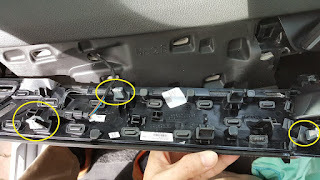 I will not be held responsible for any damages made to your dashboard during this process and there may be risk in damaging the clips or even the entire dashboard during the process. It is recommended to have two person to perform this job if you are doing it the first time. Here are the closeup photos of the aircon dash board. Notice the underneath highlighted area of the clips which you will need to pry it open. Step 6: Lift up the screen and check the back of the screen. There is a purple connector which provides the power and signal to the screen. Notice that there is a clip on the purple connector which you will need to push to unlock before pulling it out. It is held tightly and you may need the prying tool to assist in pulling it out. Step 7: Replace it with the new 8.8 inch. The display will not show anything until you had performed your coding. Step 8: Time to code! Step 9: Put your new 8.8 inch screw display back to the holder and screws it back using the same set of screws. Be very careful and make sure you do not drop your screws into the holes at the central console. Put back your dash board by pushing it back till you hear the "click" sound and put back your CD covers and the plastic cover. Thanks mate. Very useful DIY. You are welcome... Hope you learn something about this important and popular mod! How do you code the display? What do I need and where do I input the values? This is a very great DIY guide! Thanks a lot for sharing this! Btw, may I know what is the PN for the 8.8" LCD? Part number for F45/F46 is either 9387450 or 9370871. Cheers! May I know where can we get this part? You can get the used part from Ebay. Other online stockist do sell brand new as well but the price is around USD 2000! You can try TB if you want. You have to confirm with the seller that they are selling "F45" model and not "F48" which is for X1. Also, ask them to package the product properly with sufficient protection. Nice, after this upgrade, do you get album art when playing music from usb, and play video directly from usb? Album art works but not USB video. USB video is only supported in Navigation Professional (609) and anything lower like Navigation PLus (6UP and 6UN) does not support USB video even though video codecs have been enabled. This is a limitation on the hardware side. Album art works but not video playback from USB since the EntryNav (Business Navigation) does not support USB video playback. Only audio works. Thanks. Can I upgrade it to NBT with navigation and touchpad? 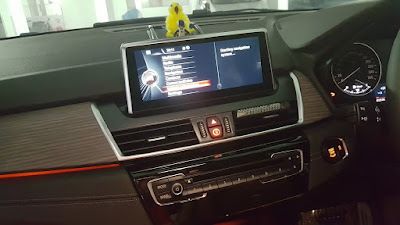 For F45/F46, you can upgrade it with navigation with touch idrive knob. 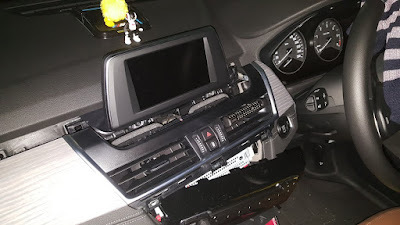 Touch idrive upgrade is mentioned in my blog. Professional navigation (609) or Business navigation (6UN or 6UP) can be used. 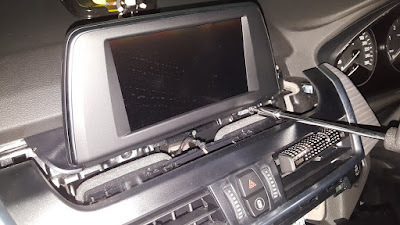 However, it looks like there is an additonal cable for the head unit for those with navigation. I am still exploring it. Would you be considering to retrofit to install HD-link? seem like a very promising device for mirroring, anyone try it? it seem wires need to be sliced will this void warranty ? Hi! thanks for sharing all this info, is really helpful!! By the way, if you are bored, I recommend you doing some vinyl wrapping of the central console, but only if you do not like the black-piano dust-catcher finishing of the original one... Check the 3M Scotchprint 1080 Black Brushed vinyl, you will like it. Thank you for the great and detailed guide. Now for some one new like me would it be possible to make a video or a similar guide on how to code it using e sys. It will be really apriciated thank you. This particular is not available. 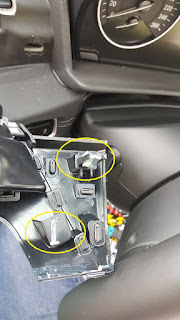 Hi, Robot Lover, well done with the DIY guide but I would need more detailed instructions for the F48 vehicle as the dash trims are slightly different - central dash trim (with A/C and radio) is one piece item (don´t know where to start - no screws?) and long air vents dash trim is also different. Please add photos of the procedures with F48 X1 vehicle or at least add detailed text. Also with the coding - I currently have the value 10.25_1280x480 within DISPLAY_SIZE_RESOLUTION string - although I actually have 6.5 inch screen. My question is whether should I leave that value or change it to 8.8_1280x480? Thanks in advance for your help. Best regards, E.
Sorry, I don't have access to a X1 to show you how it can be done. You will need a different set of tool to pry open the central dash trim. You can check out the realoem.com to see how the parts looks like and to determine whether it can pry out safely. Please share the photos with me if you are able to do so. You will need to change the screen resolution to 8.8_1280x480 when you change it to a bigger screen. Strangely, the default value is "10.25_1280x480" for X1 but it has to be changed to support 8.8 inch screen. Hello. Where can I buy the 8.8 inch screen? Ebay is your best bet..
Hello Sir, hv proceeded with change of screen (6.5 to 8.8) on my X1 F48 following the above steps however, what i really cannot understand is the encoding step, my 8.8 is totally black, how do i insert new commands ? 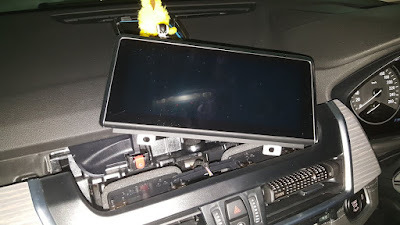 You will need to use E-sys to code your car to enable the 8,8 inch display resolution. You can find out how to code by checking "E-sys" in youtube. If learning coding is not your strength, you have to find someone that knows how to assist you.. Thank you a lot ! Do you hv any idea of the info that i should hv with me that will be requested during encoding ? 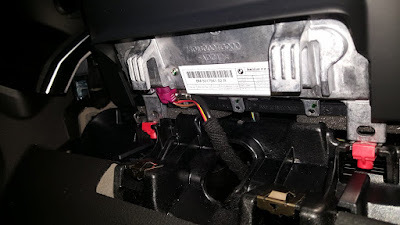 What is the best way to remove that plastic cover under the cd player, I can pop out the first 2 pins at the front but it seems to be stuck at the back somewhere? Hey there and thanks a lot for the valuable info. I do not have navigation on my 6.5 screen and I have upgraded to an 8.8 one (android). Will the split screen be available as coding? Yes, after coding split screen will be available, but you will have to set it up under idrive display options... Best regards, E.